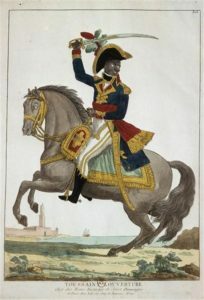 Toussaint Louverture, chef des insurgés de Saint-Domingue. Estampe en couleur Anonyme, 19e siècle. Source: Paris, bibliothèque nationale de France. Rights: (C) RMN, Agence Bulloz. Toussaint L’Ouverture is an important and much mythologized figure. Sudhir Hazareesingh’s upcoming biography intends to offer a deeper insight into the man at the heart of the myth, and this paper entitled ‘Rethinking Toussaint L’Ouverture’ offered an insight into his plans for that project. Starting by exploring the expansive literature around Toussaint and the Haitian Revolution, Hazareesingh stressed the multiple readings of the struggle. It was a revolution in its own right, both belonging to an age of Atlantic Revolutions and possessing its own force. Yet, it can also be seen as a series of revolutions between 1791 and 1804, representing social, intellectual and cultural transformations that were variously anti-imperial, democratic, republican, racial, and geared towards national liberation. Toussaint too has been a figure viewed in different lights; from the original hostility in Haitian historiography, to the ‘cult of Toussaint’ in Benin, via his totemic depiction as ‘Black Jacobin’. After surveying these different approaches, Hazareesingh explained his desire to recapture Toussaint’s own voice by re-engaging with the large (and extremely distributed) collection of written material he left behind. Reports, letters, and speeches from across these scattered archives yield visions of Toussaint as strategist, constitutional thinker, and political operator. Yet they also give some greater sense of his character. Far from his depiction as ‘mysterious’, ‘fickle’, or ‘opportunist’ in existing writing, Hazareesingh sees great stability, a focus on private virtue, and a realistic engagement with political currents. This is what makes Toussaint such an original figure, with different strands of his identity housed within the broad church of revolution: a republican with a sense of religious morality which traversed his personal, political, and public life. Slavery also complicates this picture, through Toussaint’s own life, and through his relationship to the political ideals which both fought for emancipation and compromised that freedom in Article 17 of the Constitution. Hazareesingh’s paper profiled this complex figure, with his seeming contradictions, to present a more intimate portrait of Toussaint than that to which we might be accustomed. His focus on Toussaint’s own words and a desire to meet him on his own terms suggests what promises to be an outstanding biography.